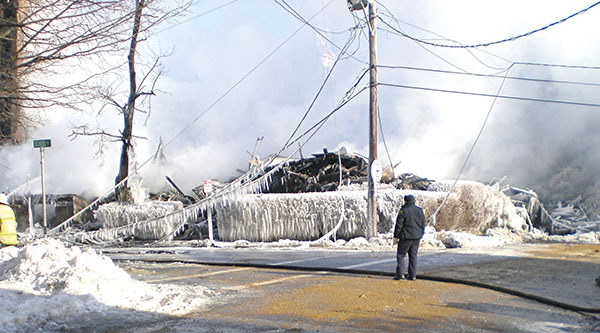 A Gloucester police officer inspects the aftermath of the fire that destroyed Temple Ahavat Achim in 2007. NOVEMBER 30, 2017 – GLOUCESTER – Hanukkah 5778 carries special meaning for Temple Ahavat Achim in Gloucester. Observance of the eight-day festival commemorating the rededication of the temple after the Maccabee triumph is inextricably linked with the lighting of flames. Ten years ago, in the early hours of December 15, flames spread from a fire in the Lorraine Apartments on Middle Street to the neighboring temple. Within hours, news spread among members that their temple had been destroyed. The eight-alarm fire had been fought in frigid temperatures for hours by firefighters from communities all over the area. The sun rose on an otherworldly scene of ice and smoke and still-smoldering embers. As congregants arrived, they learned that the temple and apartment building had burned to the ground, and that an apartment resident, Robert Taylor, had died in the blaze. The tenth anniversary of that fatal fire has inspired both reflection and rededication within TAA. Temple President Amy Farber has vivid memories of the fire and its immediate aftermath. Like many members, she learned of the tragedy from a telephone call in the pre-dawn hours of that Saturday. It was Shabbat. Samuel Barth, the temple’s rabbi at the time, immediately contacted his colleague Wendy Fitting, minister at the nearby Unitarian Universalist Church, who generously offered space for the morning services. Word spread quickly, and Farber remembers about 150 people showing up at the church. Both Governor Deval Patrick and Gloucester Mayor Carolyn Kirk stopped in to offer help and sympathy. Rabbi Barth led prayers and invited people to share their thoughts and feelings about the temple and the tragedy. For Farber, the most chilling moment was when firefighters, still in their turnout coats covered with ash, entered the church with a few salvaged objects; Deputy Fire Chief Phil Dench in the lead carrying a stack of tallises. On their own, children from the religious school started sorting and folding the prayer shawls. The outpouring of support from the larger community was immediate and inspiring. Soon prayer books, Torah scrolls, tallises, and donations started pouring in from around the country and around the globe. Remembering the event and the busy times that followed, then co-president Lou Goldish said, “Not that I would recommend burning down a synagogue, but the fire revitalized us as a community.” With reference to the historic First and Second Temples, he noted ours was not the first time in Jewish history that destruction had led to renewed vitality in Judaism. The Gloucester fire energized and mobilized the congregation, which had to seek creative solutions to everyday challenges and tackle hard decisions about future directions. Working initially out of temple co-president Carole Sharoff’s business office, with planning help from her husband Bill Fonvielle, the synagogue quickly put together committees and task forces focused on immediate needs, long-term planning, and preserving the past. Space for a temporary temple, which came to be affectionately known as the TempTemp, was rented at 33 Commercial Street, with major events like the High Holy Days sited at CruisePort on the harbor front. Under the leadership of Phil and Eve Cutter and Peter Feinstein and Miriam Weinstein, the synagogue established aggressive and creative fundraising for both an endowment fund and a building fund. After extended debate, the congregation decided to rebuild on Middle Street despite the small site that would allow only limited parking. “Gloucester and Cape Ann had been so good to us,” Sharoff said. 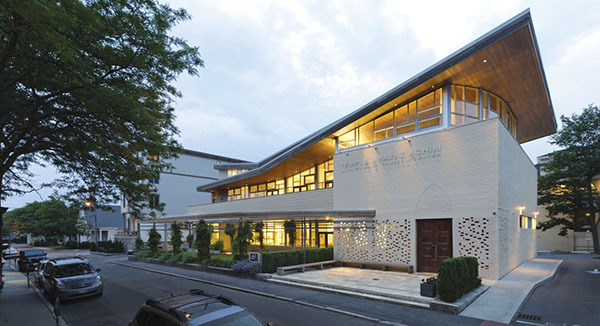 “We wanted to stay with, and give back to the community that had so generously opened its arms.” It took until 2011 to complete the new building, but, in the interim, the synagogue never missed a service or session of the religious school. The fire and the rebirth of the synagogue even inspired works of music. A new choral setting of the traditional blessing, Shehechiyanu, premiered at City Hall to celebrate the groundbreaking for the new building in 2010. It also opened the program for a 2012 premier in the completed new building of another work inspired by the fire: “As Our Voices Begin to Rise” by local composer Robert Bradshaw. Rabbi Steven Lewis, whose tenure began shortly after the move into the new building, started thinking about the anniversary observance at Tisha B’av this year. Reflecting on fragments of burned books and a broken menorah salvaged from the fire, he realized that 10 years had passed since that transformative event. Resilience and rededication will be front and center at the temple’s upcoming Hanukkah events. On Tuesday, Dec. 12, the community will mark the first night of Hanukkah by assembling at the Gloucester Unitarian Universalist Church at 10 Church Street to make the short walk from there to the temple. There, the newest incarnation of the synagogue’s novel menorah built out of local lobster traps will be lighted, after which everyone will be invited inside for a brief program followed by refreshments. Attendees will enter through massive wooden doors salvaged and restored from the only wall of the old temple left standing after the fire, and they will walk over stonework from the original building. On Saturday, Dec.16, the temple’s Hanukkah party for all ages will begin at 5 p.m. with the lighting of the lobster-trap menorah, and will be followed inside with a mass candle lighting (bring your own menorah) plus songs, food, and a wine bar. Those interested in attending should RSVP to the temple by Dec. 8. Larry Constantine is a freelance journalist and photographer. The Intaglio Imprint, his tenth novel under his pen name, Lior Samson, was just published. Lovely story. Congratulations, Larry C., Rabbi Lewis and Temple leaders – then and now. So often catastrophe or persecution actually revitalizes a community… it’s a sad commentary on the human condition that we need to be reminded of how important community really is to our survival. Wonderful story about a holy happening.